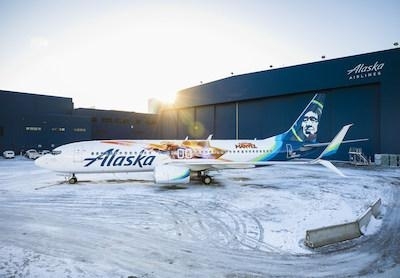 Ahead of the highly-anticipated release of Marvel Studios' Captain Marvel on March 8, International Women's Day, Alaska Airlines unveiled a special-edition plane today, featuring Marvel Studios' first female Superhero lead. The Captain Marvel-themed plane was debuted today at Sea-Tac International Airport at a gate celebration for guests flying to Orange County, CA. "This new plane featuring Captain Marvel will delight guests of all ages," said Natalie Bowman, Alaska Airlines' managing director of marketing and advertising. "We're excited to showcase a pilot who's risen to Superhero status––an image that embodies strength and confidence and inspires future aviators across our expansive network to go further." Decked out in a stunning red and navy suit, Captain Marvel is taking flight and commands the attention she deserves as a female pilot who acquired special powers to fight for the greater good. Guests boarding the Captain Marvel-themed plane will see a film logo when they board. An image of a cat named Goose from the film, will surprise guests seated over the wings. "Our collaboration with Alaska Airlines is taking our fans 'Higher, Further, Faster' with this amazing opportunity to fly with our fearless Superhero and pilot, Captain Marvel," said Mindy Hamilton, SVP of Global Partnerships for Marvel. "We are so excited that our fans will be accompanied by Carol Danvers on their next adventure." The Captain Marvel-themed 737-800, tail number N531AS, begins flying throughout Alaska's route network today. With a cruising speed of 530 mph and sporting a larger-than-life image of the movie's namesake Captain Marvel, the plane will visit fans throughout the country via cross-country routes and flights to Hawaii.